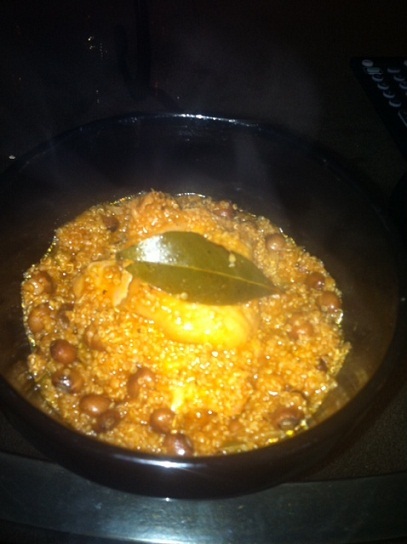 healthy recipes | The High Life Suite | Fashion. Food. Love. Over the last couple months, I’ve been trying to take a healthier approach to life. Exercising, eating better, just taking better care of my body period. I’m used to eating whatever I want and just not caring about it, but the older I get, the more I realize that that just won’t cut it. Now is the time to start adding more healthy options to my diet and although healthy some times means not quite as tasty as fatty, high calorie options, I’m committed to adding my own enjoyable twist to “healthy” foods. That commitment is what made me decide to come up with an easy quinoa recipe that would be both healthy and nomaliscious. I LOVE Caribbean style peas & rice but we all know white rice has it’s drawbacks, that’s when it clicked in my head that I could sub out the rice and replace it with quinoa. Add chicken and some other chopped veggies and I’d have a dish worth eating! 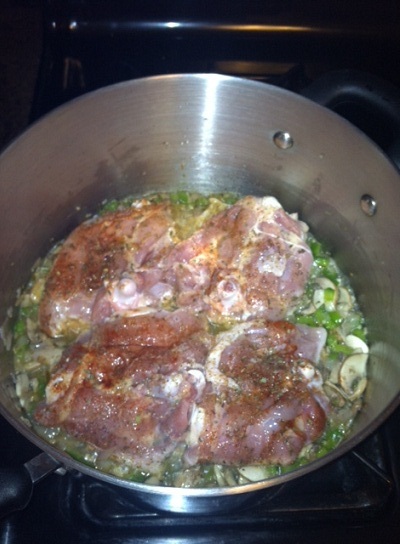 Thoroughly clean and season your chicken with the spices/herbs of your choice and set aside. 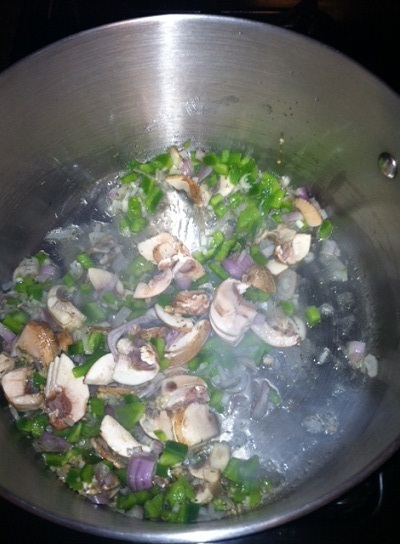 Chop your shallot & bell pepper and slice your mushrooms. Add enough vegetable oil to a deep pot to cover the bottom and once hot, add in the shallot, bell pepper, mushrooms and tablespoon of crushed garlic. Saute until the shallots are translucent and the veggies have softened. 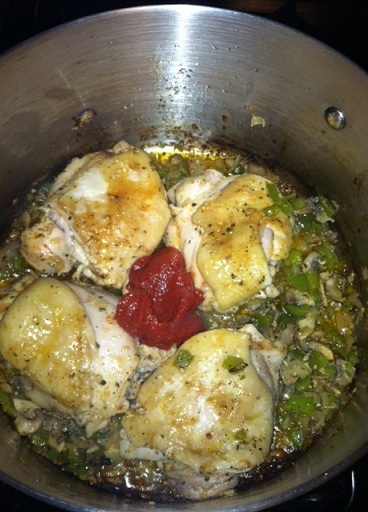 Add your chicken, skin side down to pot and allow it to brown. After about 10-15, you don’t want the chicken to be all the way done since it will have more time to cook, go ahead and add in the tomato paste. As well as the cup and a half of quinoa. And the bay leaf and chicken/vegetable stock. Bring the pot to a boil and then cover. 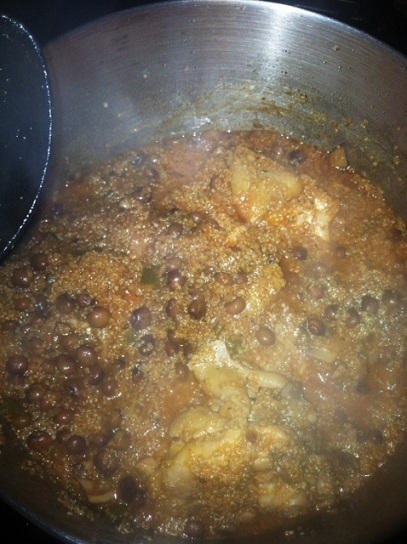 Allow the ingredients to cook for 15-20, checking back periodically to make sure that all the liquid hasn’t evaporated. 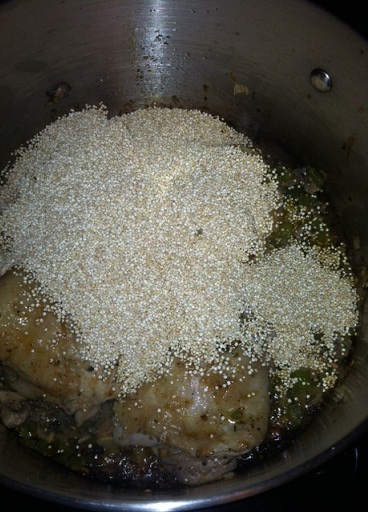 You’ll know when the quinoa is done because it will be translucent in the center and look like there’s white threading surrounding it. You’ve got a healthy, one-put dish that takes less than an hour to prepare and is really yummy! 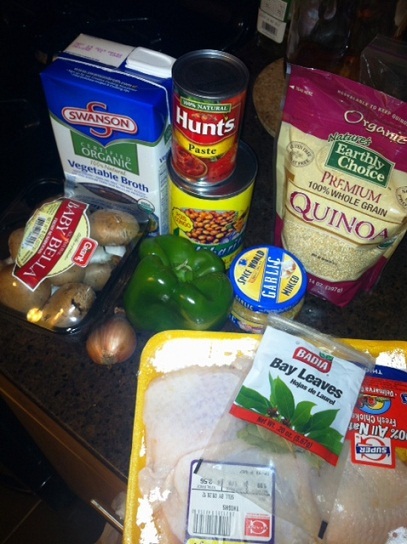 Is there a quinoa recipe that you love? Share it with us! I grew up hating vegetables. Absolutely, positively abhorring them. I was the kid that had to be threatened to not be allowed any dessert in order to eat my veggies. And even when I did eat them, I usually held my breath while chewing so I didn’t have to taste them. I was that bad. And to be perfectly honest, it wasn’t until I moved out on my own a few years ago, that I discovered that I could actually create vegetable dishes that are enjoyable. One of those dishes is a savory kale recipe that I concocted while trying to find a great way for me to incorporate this superfood into my diet. 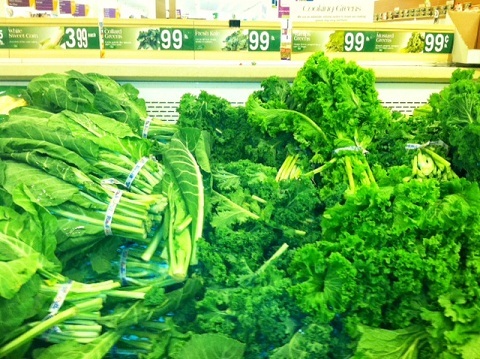 Kale has somewhat become the vegetable of the moment, a trend if you will. And rightfully so; kale has some amazing benefits. It’s full of vitamins K, C and calcium; just to name a few benefits. You can juice it, bake, fry it, saute it. Put it in salads, soups, incorporate it into a variety of dishes; or you can allow it to stand alone. 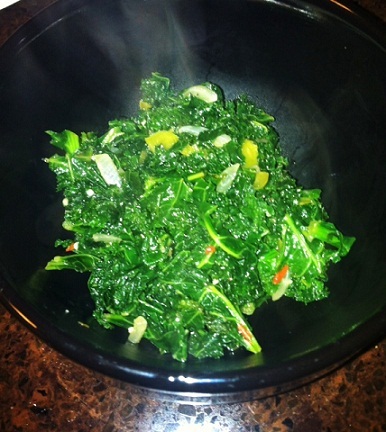 I love savory dishes that are full of flavor so it’s only right that my kale get the same treatment! 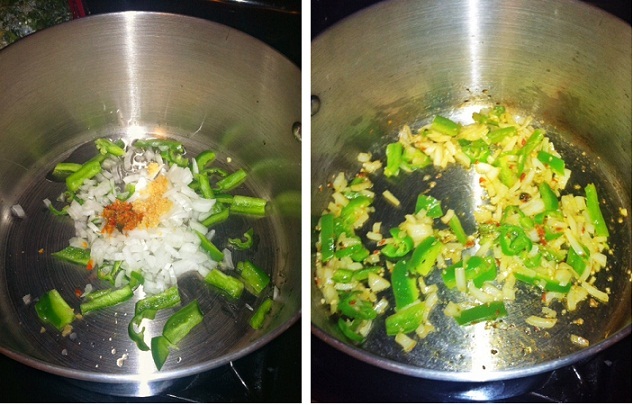 Dice the yellow onion, bell pepper and long green pepper. Heat the vegetable oil in a deep pot and add the diced vegetables, garlic and chilli paste. Allow them to cook down until the onions become translucent. Now it’s time to add in the kale. If you bought your kale in a bunch, like the first pic in this post, you’ll want to de-stem and tear or cut the kale into smaller pieces. 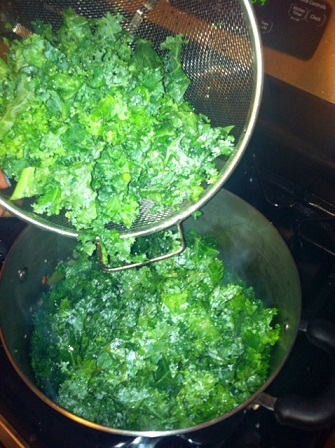 I lucked out and found a 2 lb bag of pre-torn kale at my local grocer, so all I had to do was rinse, drain and add the kale to the pot. Add the kale in bit by bit. As with most other greens, there will be considerable shrinkage once cooking has finished but it will start out looking like a lot. 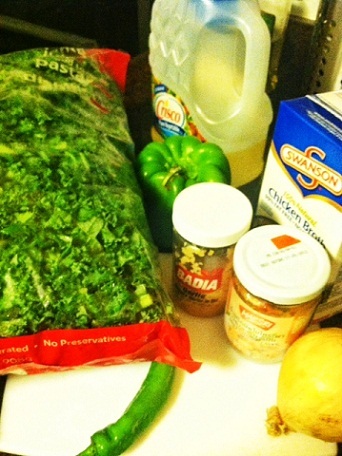 Mix the kale with the other veggies. 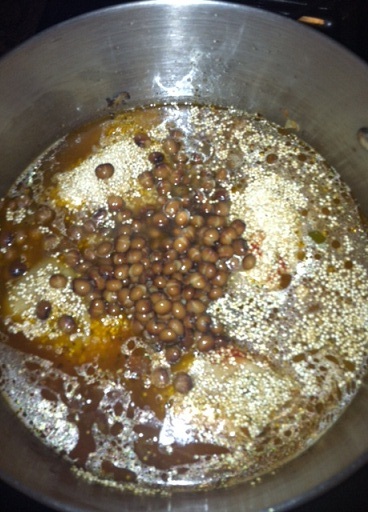 Add in the 3/4 cup of stock and cover. 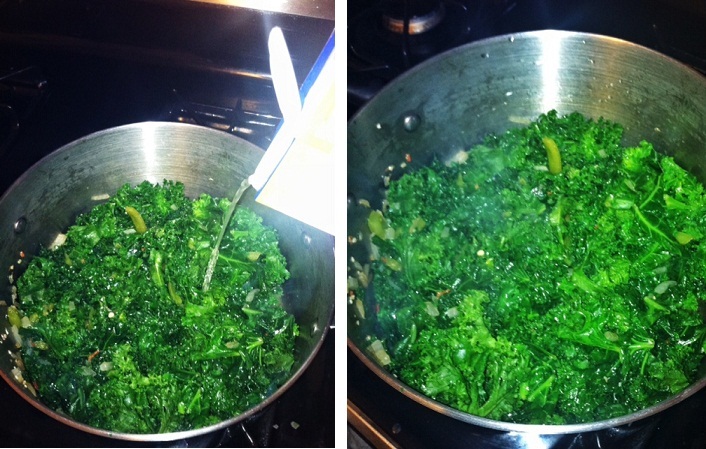 Let the kale simmer for 20 minutes or until the kale has cooked down and the color has changed to a darker green. And there you have it!! A savory vegetable dish with a kick! It’s quick, it’s easy, it’s cheap AND it’s totally yummy! And coming from a former vegetable hater, that says a lot! Have you ever tried kale? What are some of your favorite recipes?